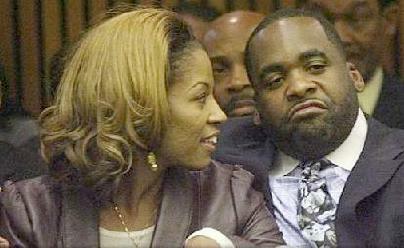 Kwame and Carlita Kilpatrick during the sentencing in his infamous trial in October 2008. *Part of the reason Detroit went into a tailspin is due to the unfortunate state of “affairs” that Kwame Kilpatrick left behind along with his highly publicized scandals. But, long after the dust has settled on the case and he’s served one jail sentence and is in the middle of another, he has filed a lawsuit against the cell phone companies that released his texts (that he denied ever making) to the media. Motown’s financial woes are partly due to this long drawn out case against the former mayor. The city had to shell out hard earned tax dollars to defend the then mayor.